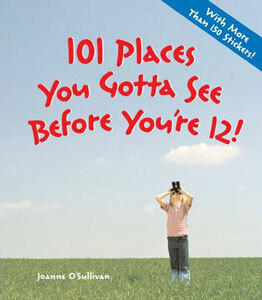 Looking for some adventure with your kids this summer, check out 101 Places You Gotta See Before You're 12! . The thing I like about this book is that it encourages curiosity, a sense of adventure and civic awareness, all without spending a lot of money on travel expenses, since most of the must see places are general enough that you can find them close to home. Adventures include visiting an elected official's office, an artists studio, a marvel of engineering, a parent's office, a wildlife refuge, a landfill and the teacher's lounge.